Commentary on a Harmony of the Evangelists, John Calvin: Luke 1:39-45, Luke 1:46-50, 1558. "He has scattered them, and the imagination of their hearts; or, by and through the imagination of their own hearts; so that their wicked counsel turned to their own destruction." "It is very good for those who have the work of grace begun in their souls, to communicate one to another." "And she rejoiced in hope of salvation through faith in him, which is a blessing common to all true believers, more than in being his mother after the flesh, which was an honour peculiar to her." "What beautiful superiority to envy have we here! High as was the distinction conferred upon herself, Elisabeth loses sight of it altogether, in presence of one more honored still; upon whom, with her unborn Babe, in an ecstasy of inspiration, she pronounces a benediction, feeling it to be a wonder unaccountable that 'the mother of her Lord should come to her.'" "These two godly women are the first human prophets of the New Testament." Living by the Word, Austin Crenshaw Shelley, The Christian Century, 2018. "Mary and Hannah and a Woman in the County Jail," Janet H Hunt, Dancing with the Word, 2018. "What darkness, what despair, does Mary’s song bring light and hope to for you in the midst of your life this season?" Commentary, Luke 1:39-45, (46-55), Judith Jones, Preaching This Week, WorkingPreacher.org, 2015. "May we, like Elizabeth and Mary, trust that God is coming to save and free us." "Learning from Mary in Our Age of Endless War," Matthew L. Skinner, ON Scripture, Odyssey Networks, 2015. Includes discussion questions. Video: Beating Swords into Plowshares to End Gun Violence. "Singing as an Act of Resistance," David Lose, ...in the Meantime, 2015. "Would you consider, on this Fourth Sunday in Advent, omitting the sermon in favor of a hymn sing?" "A Merciful Advent," Karoline Lewis, Dear Working Preacher, 2015. "Listen closely. Anything sound familiar in Mary's Magnificat?" "A Blessing Called Sanctuary," Jan Richardson, The Advent Door, 2015. "Where will we go, like Mary, to find and receive such a blessing? How will we open our heart, like Elizabeth, to offer it?" The Truett Pulpit, J. David Tate, 2015. "Perhaps rather than directing the lyrics of Mary's Hymn – teasing apart lines and words of theology, expectation, politics, or justice, we ought to instead help her message to be sung with power and rousing inspiration." "Hope and Peace," LECTIO, Eric Smith, 2015. "Visit a family member," Lynn Miller, Art & Faith Matters, celebrating our creative and living God by generating art and architecture resources for congregations and individuals. Art and Faith Matters facebook page contains additional resources. "Blessed Are You Among Women!" Bob Cornwall, Ponderings on a Faith Journey, 2015. "Love Is a Many Splendored Thing - and Advent's Greatest Challenge," Anna Shirey, The Labyrinth Way, 2015. "Every pure and virgin soul," Andrew Prior, First Impressions, 2015. "Luke is not intending to present us with a miracle which contradicts biological truth and necessity. We make a category mistake if we believe he is even thinking about biology. He is presenting to us the intervention of God in our world; the filling of people with holy spirit. It is all to set the stage for Jesus' birth and subsequent ministry." "Coming," Journey to Penuel, 2015. "Song of Hope," Alan Brehm, The Waking Dreamer, 2015. "In Advent we sing because we look forward to something better than the violence and suffering and injustice all around us. We look forward to the kindness and generosity and compassion of our God being fulfilled for all the peoples of the world." "Like Mary Did," Janet H. Hunt, Dancing with the Word, 2015. "Do you have a favorite artistic rendering of Mary? What do you see when you when you experience it?" "The Politics of the War on Christmas," Robert Williamson, Jr., Political Theology Today, 2015. "No More Lying about Mary," "The Foxy Foremothers of Jesus," Nancy Rockwell, The Bite in the Apple, 2015. Comentario del San Lucas 1:39-45, (46-55), Pablo Manuel Ferrer, Working Preacher, 2015. Commentary, Luke 1:39-45, (46-55), Rolf Jacobson, Preaching This Week, WorkingPreacher.org, 2014. "Mary’s Psalm announces, 'No, Christ has come to challenge the structures of sin, death, the devil, and oppression. Christ has come in the strength of the Lord to do what the Lord has always done: lift up the lowly, free the enslaved, feed the hungry, give justice to the widow, the orphan, and the sojourner.'" "Mixed Messages," Unvirtuous Abbey, 2013. Commentary, Luke 1:39-45, (46-55), Karl Jacobson, Preaching This Week, WorkingPreacher.org, 2012. "As we have prepared for the coming of the Christ Child, now we too can sing in thanksgiving, in celebration, in remembrance, and in proclamation of the promise made to our ancestors." "Can We Speak of God's Activity, in Triumph or Tragedy?" Matthew L. Skinner, ON Scripture, 2012. "Mary offers an example and invitation for speaking boldly about God’s activity." "A Promise That Changes the World," David Lose, WorkingPreacher, 2012. "According to Luke, when Mary sang, she didn’t just name those promises but entered into them. Notice, for instance, that the verbs in Mary's song are all in the past tense. Mary recognizes as she sings that she has already been drawn into relationship with the God of Israel..."
"Two Prophetic Women, A Lord, and a Leaper," D Mark Davis, raw translation and exegesis/questions, Left Behind and Loving It, 2012. Lectionary Greek, Luke 1:39-56, Rob Myallis, 2012. "Mary, the Reluctant Prophet," Alyce M. McKenzie, Edgy Exegesis, 2012. "For Luke, Mary is first a prophet." "A Song Pregnant with Hope," Christopher Burkett, PreacherRhetorica, 2012. "For hundreds of years the prayers of Mother Mary have been associated with God’s mercy. If God has often been drawn in stern terms of justice and judgement – Mary has frequently provided the counterbalancing appeal to the more homely and comforting aspects of faith." "The Politics of Luke 1:39-45," Amy Allen, Political Theology, 2012. "There are a lot of 'big' problems that lowly as we are, we cannot dare to solve. But the message of the magnificat is that we don’t have to. We need only to follow our merciful and Mighty God who comes among us in the tiniest, most imperceptible of ways, favoring the small, the weak, the lowly, and promising faithfulness from generation to generation." Holy Textures, Understanding the Bible in its own time and in ours, Luke 1:39-45, (46-55), David Ewart, 2012. "God Bearer," Nancy Rockwell, Bite in the Apple, 2012. "Mary sings stunning words: the fruitfulness of the reign of God will be increased through her child." "The Song Of Mary," Mother Anne Emry, Sacred Story, 2012. "An Expectant Kick," Katie Munnik, Presbyterian Record, 2012. "Hopes and Fears," the Rev. Dr. Janet H. Hunt, Dancing with the Word, 2012. "How do the words of Mary's Song, speak to the events we have witnessed in these last days? How do these words speak to you?" "From Shame to Blessing with Haste," Rick Morley, 2012. "Escape to Judea and the Great Reversal," Richard Mario Procida, Modern Lectionaries, 2012. Mary Visits Elizabeth, audio telling, story in episodes, graphic, audio and written commentaries. Go Tell Communications, Biblical Storytelling for the Global Village, 2012. "Embracing Restoration," Alan Brehm, The Waking Dreamer. "Christmas is a time when the gaping holes in the fabric of our 'family ties' become painfully apparent. It is a time when we desperately need restoration and healing in those most basic human relationships. The future Micah and Mary looked forward to is a vision of the restoration of the whole human family. It is also a time to embrace the restoration and healing God has promised to the whole human family in our families by treading lightly and showing a little extra consideration." "You Are Highly Favored," Robb McCoy, The Fat Pastor, 2012. "Blessed Are We, Women!" Alyce M. McKenzie, Patheos, 2012. "Do You Remember Midge?" Lauren Winner, The Hardest Question, 2012. "Fake wedding rings vs. genuine welcome." "God is always on the side of those on the bottom, those who are excluded, those left out. Yet, God does not triumph over their oppressors in a vindicative act, but rather a loving one. God wants them to change and join the mission of the kingdom." Comentario del Evangelio por Diana Rocco Tedesco, Lucas 1:39-45, (46-55), Working Preacher, 2012. "Magnificat! Learning to Sing Mary's Song," Carl Gregg, Patheos, 2011. "I love that the Revised Common Lectionary includes the Magnificat as the alternative Psalm reading for the third Sunday of Advent..."
"Mary's Magnificat: The Mercy of God," Gordon Franz, Associates for Biblical Research, 2008. Commentary, Luke 1:39-45, (46-55), David Lose, Preaching This Week, WorkingPreacher.org, 2009. "Songs are powerful. Perhaps we should therefore take our cue on this day from Elizabeth and Mary and keep our preached words to a minimum to make ample room for singing." Luke 1:39-45, Advent 4C, Comments (commentary) and Clippings (technical notes for in-depth study), Chris Haslam, Anglican Diocese of Montreal. "First Thoughts on Year C Gospel Passages in the Lectionary," Advent 4, William Loader, Murdoch University, Uniting Church in Australia. "Christmas is fascinating as a place of marginalisation..."
"I wonder if most of us can read [the Magnificat] without being a little concerned about our wealth and power -- as individuals, as congregations, and as a nation." "Incarnation is an inside job," Peter Woods, I am listening, 2009. "Why do women who are touched by God have their prayers recorded by a patriarchal religion that viewed women as possessions and not people? Why would these words find a place in the hearts of the men who made the decisions of what to include and what to leave out of their Sacred Texts that they regarded as God?s Word?" "Fine and Blessed," Dr. Scott Morris, Luke 1:46-53, HopeandHealing.org. "One of the challenges of poverty medicine is realizing that you are capable of doing only so much. Poverty generates overwhelming needs." "The Fourth Sunday in Advent: Luke 1:39-55," Promises, Promises, Gracia Grindal, Word & World: Theology for Christian Ministry, Luther Northwestern Theological School, 1988. "The Fourth Sunday in Advent: Luke 1:39-55," The Birth of Jesus Never Saved Anyone: The Lucan Advent Texts, Marc Kolden, Word & World: Theology for Christian Ministry, Luther Northwestern Theological School, 1991. Luke 1:46b-55: Comments (commentary) and Clippings (technical notes for in-depth study), Advent 3A, Chris Haslam, Diocese of Montreal. "Taking Sides: Reversals," The Journey with Jesus: Notes to Myself, Daniel B. Clendenin, Journey with Jesus Foundation, 2005. "Mary and Jesus, Ambrose and Basil, each in their own way lived and spoke about the biases of God's heart." "Mary's Magnificat: All Generations Will Call Her Blessed," The Journey with Jesus: Notes to Myself, Daniel B. Clendenin, Journey with Jesus Foundation, 2006. "What Should We Say about Mary?" study guide, Robert B. Kruschwitz, (other resources at) "Women and the Church," Christian Reflection, The Center for Christian Ethics at Baylor University, 2009. Focus article: "What Should We Say about Mary?" Carole L. Baker. "To Know How to Visit," Advent 4, Fr. Gerry Pierse, C.Ss.R., from Sundays Into Silence: Reflections on the Sunday Gospels in the Light of Christian Meditation. Claretian Publications. "When we meet one another in either planned or chance visits we can support one another in pain, strengthen one another in sorrow, and guide one another in confusion. We can be God's presence to one another." Kairos CoMotion Lectionary Discussion, Luke 1:46b-55. "A place of conversation regarding Progressive Christianity." "Old and New," Larry Broding's Word-Sunday.Com: A Catholic Resource for This Sunday's Gospel. Adult Study, Children's Story, Family Activity, Support Materials. "How hard is it to give up the old and accept the new?" "Mary Visits Elizabeth," Rev. Bryan Findlayson, Lectionary Bible Studies and Sermons, Pumpkin Cottage Ministry Resources. Includes detailed textual notes. Lectionary Commentary and Preaching Paths (Advent C4), by Dennis Bratcher, at The Christian Resource Institute. "Introducing the theme of the reversal of fortune, especially against the background of the great acts of God by which He had revealed Himself and defined Himself to the Israelites throughout the OT, serves to place the impending births in the context of a reordering of the world. This anticipates not only the immediately following features of the narrative, for example when shepherds are the first to receive the news of a Savior born in the city of David, but also the role of the new community of Faith that is emerging in the world." Luke 1:46-55, Saint Mary the Virgin, Comments (commentary) and Clippings (technical notes for in-depth study), Chris Haslam, Anglican Diocese of Montreal. Luke 1:47-55, Advent 3B, Comments (commentary) and Clippings (technical notes for in-depth study), Chris Haslam, Anglican Diocese of Montreal. Luke 1:47-55, Advent 4B, Comments (commentary) and Clippings (technical notes for in-depth study), Chris Haslam, Anglican Diocese of Montreal. Wellspring of the Gospel, Feast of the Assumption, Catherine McElhinney and Kathryn Turner, Weekly Wellsprings. "Listening with the Ear of the Heart," Frank T. Griswold, Cross Currents, 1998-99. "It is our vocation to allow Christ to use our hearts. It is our vocation to come to maturity in Christ who is our Truth. We do so by attending to the Christ present in the truth of one another." Adams, Joanna M., "Double Vision," The Christian Century, 2006. Avram, Wes, Living by the Word Lectionary Reflections, The Christian Century, 2014. Benko, Stephen, "The Magnificat: A History of the Controversy," Journal of Biblical Literature, 1967. Brenner, Athalya, "Female Social Behavior: Two Descriptive Patterns within the 'Birth of the Hero' Paradigm," Vetus Testamentum, 1986. Brown, Raymond E., "The Annunciation to Mary, the Visitation, and the Magnificat," Worship, 1988. Buth, Randall, "Hebrew Poetic Tenses and the Magnificat," Journal for the Study of the New Testament, 1984. Fendt, Gene, "Visitation," Theology Today, 1993. Poetry. Foster, Ruth Ann, "Mary's Hymn of Praise in Luke 1:46-55: Liturgy and Spiritual Formation," Review and Expositor, 2003. Fryer, Gregory Paul, "Mary as Archetype of the Church: An Essay in Generosity Toward Mary," Currents in Theology and Mission, 1985. Goetz, Ronald, "The Mary in Us All," The Christian Century, 1987. Grindal, Gracia, "Promises, Promises," Word & World, 1988. Hansel, Patrick and Alison Leitzel, "Advent Questions," Currents in Theology and Mission, 1981. Dialogue sermon. Harvard, Joseph S., "Waiting Room," Journal for Preachers, 1996. Hillmer, Mark, "Between Text & Sermon: Luke 1:46-55," Interpretation, 1994. Hyers, Conrad, "The Nativity as Divine Comedy," The Christian Century, 1974. Jensen, Bonnie, "We Sing Mary's Song," Word & World, 1987. Kay, James F., "Mary's Song - And Ours," The Christian Century, 1997. Kershner, Shannon Johnson, "Advent Sermon: Luke 1:39-55," Journal for Preachers, 2007. Koontz, John V. Grier, "Mary's Magnificat," Bibliotheca Sacra, 1959. Kuhn, Karl A., "The 'One Like a Son of Man' becomes the 'Son of God,'" Catholic Biblical Quarterly, 2007. Lewela, M. Pauline W., "Mary's Faith -- Model of Our Own: A Reflection," AFER, 1985. Lovette, Roger, "A Vision of Church," The Living Pulpit, 2000. Martin, James P., "Luke 1:39-47, Expository Article," Interpretation, 1982. Mhagama, Christian L, "God Does the Unexpected: Luke 1:38-55," International Review of Mission, 1988. Miller, Patrick D., "The Church's First Theologian," Theology Today, 1999. O'Day, Gail R., "The Praise of New Beginnings: The Infancy Hymns in Luke," Journal for Preachers, 1990. Ortberg, John C, Jr., "Living by the Word: Luke 1:39-45(46-55)," The Christian Century, 2009. Russell, Letty M., "God's Great Reversal," The Christian Century, 1991. Siciliano, Jude, O.P., "Advent: The Coming of Christ and His Justice," The Living Pulpit, 1997. Sharapan, Hedda, "Think of the Children First: What I Continue to Learn from Fred Rogers," The Living Pulpit, 2003. Stendahl, John, "Mary Says Yes," The Christian Century, 2002. Swanson, Richard W., "Magnificat and Crucifixion: The Story of Mariam and her Son," Currents in Theology and Mission, 2007. Tannehill, Robert C., "The Magnificat as Poem," Journal of Biblical Literature, 1974. Taylor, Barbara Brown, "Surprised by Joy," The Living Pulpit, 1996. Wiberg, Glen V., "God's Surprise," The Christian Century, 1994. Wilhelm, Dawn Ottoni, "Blessed Are You," Brethren Life and Thought, 2005. Poetry. Wilson, Brittany E., "Pugnacious Precursors and the Bearer of Peace: Jael, Judith, and Mary in Luke 1:42," The Catholic Biblical Quarterly, 2006. Wink, June Keener, "Joy in the Dance," The Living Pulpit, 1996. "Learning to Focus," the Rev. Dr. Casey Baggott, Day 1, 2012. "Head of Household," the Rev. Dr. Scott Black Johnston, Day 1, 2006. "Mysterious Visitations," the Rev. Dr. Kathi Martin, Day 1, 2003. "The Magnificat and God's Revolution"
"The Birth of Christ and the Birth of Christmas"
"An Angel Visits Mary," Illustrating the Story (lessons, children's sermons), coloring pages, activity sheets, crafts, children's songs. MSSS Crafts. "The Birth of John the Baptist," children's study, puzzles, coloring sheet, etc. Higher Praise Christian Center. "A Visit To Ain Karim," from A Certain Jesus by Jose Ignacio and Maria Lopez Vigil. Ideal for catechetical and liturgical dramatization of today's gospel. Claretian Publications. 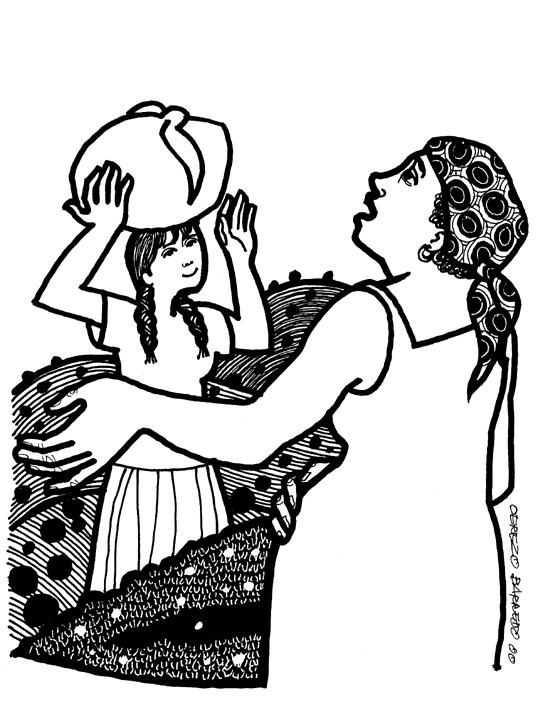 Free Public Domain Clipart for Church Bulletins: Luke 1, Mary, Church Bulletin Resources. Clip Art Images: Luke 1:39-45, Misioneros Del Sagrado Corazón en el Perú. Luke 1:39-45, at Cerezo Barredo's weekly gospel illustration. Liberation emphasis. "The Lowly Will Be Lifted Up" a hymn by Carolyn Winfrey Gillette, recalls Mary's Magnificat, and celebrates ways we can share God's blessedness with others. Tune: ST. ANNE 8.6.8.6 ("Our God, Our Help in Ages Past"). “Mary Gladly Told Her Cousin,” an original hymn by Carolyn Winfrey Gillette based on Mary rejoicing in the promise of Jesus before his birth, the Magnificat (Luke 1:39-56). This hymn was commissioned by The Presbyterian Outlook magazine for new Advent hymns to Christmas carol tunes. Tune: IRBY 8.7.8.7.7.7 (“Once in Royal David's City”). “Mary Heard the Angel's Message,” an original hymn by Carolyn Winfrey Gillette celebrates many biblical stories about Mary, from before Jesus' birth, fleeing from Herod, his teaching about his family, her presence at his death and with the disciples after his resurrection. This hymn is in the Episcopalians’ Voices Found. Tune: BEECHER 8.7.8.7 D “Love Divine, All Loves Excelling”) and HYFRYDOL (“Alleluia, Sing to Jesus”). Hymns with Scripture Allusions: Luke 1:47, 50. The Cyber Hymnal.